One of our goals at the Community Learning Initiative is to develop long-term partnerships with organizations so that we can collaboratively work together through multiple dimensions of a project. We recognize that community-focused projects are rarely confined to the academic calendar, and thus, we are developing multiple partnership avenues to help organizations reach their goals. One example of such a partnership is with Hartford Community Loan Fund (HCLF), a Community Development Financial Institution, which seeks to provide and promote just and affordable financial services that benefit low-wealth residents of Hartford. Starting in January 2017, HCLF began working with Trinity faculty and students to compile research and documents that challenge assumptions about who applies for and obtains loans to purchase homes in the Hartford metro area. Drawing on the National Community Reinvestment Coalition’s report on home mortgage lending in St. Louis, Milwaukee, and Minneapolis, HCLF is working to see to what extent banks are fulfilling the Community Reinvestment Act (CRA) which maintains that financial organizations have an obligation to help meet the credit needs of their local communities. But working through the extensive data on mortgage lending in Hartford required a few extra sets of eyes. In Spring 2017, James Jeter and Rex Fowler from HCLF collaborated with Nhat Pham (‘18) through a Data Visualization course at Trinity to assess patterns of bank lending in Hartford’s neighborhoods in order to determine what banks are effective at investing in Hartford’s low income neighborhoods and which are not. Using public data for the Hartford metro area from the Home Mortgage Disclosure Act, Nhat developed an interactive digital map to visualize loan approval rates for different neighborhoods, creating a broad visual analysis of where banks are located and where loans are frequently approved. See Nhat and James’ presentation here. Nhat, James, and Rex are continuing their work this summer, this time joined by Ken Haas (‘21), Professor Diane Zannoni (Economics), and Professor Carol Clark (Economics). Nhat is serving as an intern at HCLF, and she and Ken will be CLI Research Fellows in 2017-18, mentored in this project by Zannoni and Clark. The group is expanding Nhat’s original analysis in two ways. First, loan applications in the Hartford Metropolitan area will be analyzed to determine the effects on loan approval of the applicant’s individual characteristics and neighborhood characteristics. Second, a variety of quantitative techniques will be used in the analysis. Through this analysis, they hope to offer hard data and research to civic leaders and community organizations in Hartford along with local banks to illuminate current loan practices, while encouraging area banks to use home mortgage lending as a way to increase investments in currently underserved areas of the city and to uphold their CRA obligations at the same time. 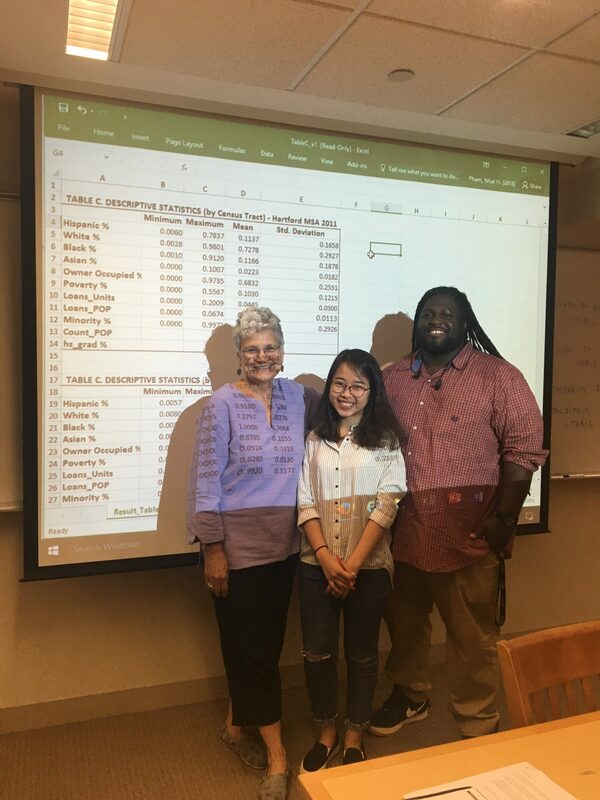 This work over the summer has also made possible further partnership with Zannoni’s Basic Econometrics students, who spend the fall semester working in groups to examine and conduct econometric analysis of large data sets. In the process of doing their research over the summer, the group has cleaned up and prepared two data sets, application materials and census tract materials, for further analysis. Zannoni’s students in the fall will be able to investigate these data further, asking questions such as : Who received loans and who didn’t? What individual factors seem to contribute to those decisions? Jeter and Zannoni hope that this fall course will interest another group of students in partnering with HCLF on these questions. 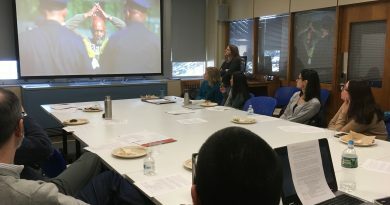 Ultimately, they want to create a large database that HCLF and Trinity students and faculty can continue to update and track over time, bringing in new students to help with the management and analysis of these data sets to continue supporting HCLF’s work toward creating a more equitable Hartford for all of the city’s residents.